So I guess this is probably my first interiors post? 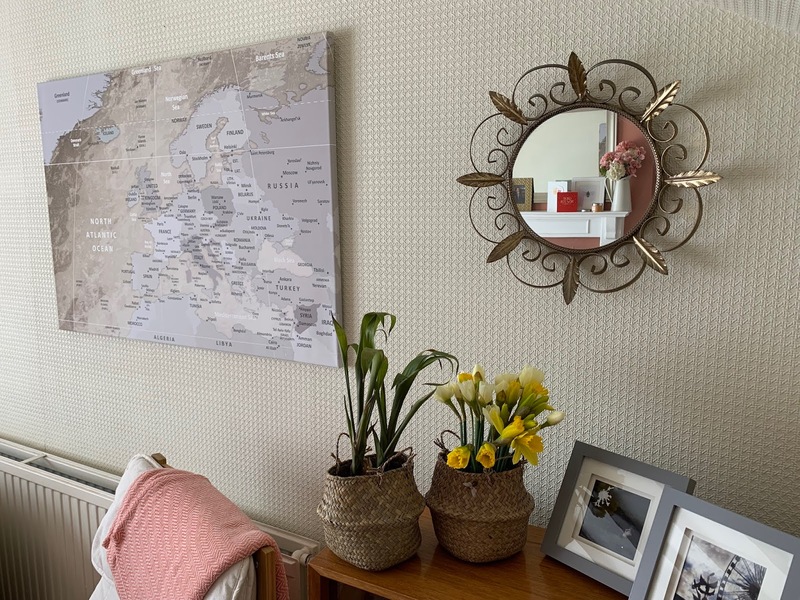 I know I've done various lifestyle stuff over the years as well as the plus size fashion, but living in a rented property has meant I've always struggled to see myself doing real interiors stuff, because after all, it's not my house is it? But one way I have always tried to make my make on the places I live is with wall art. 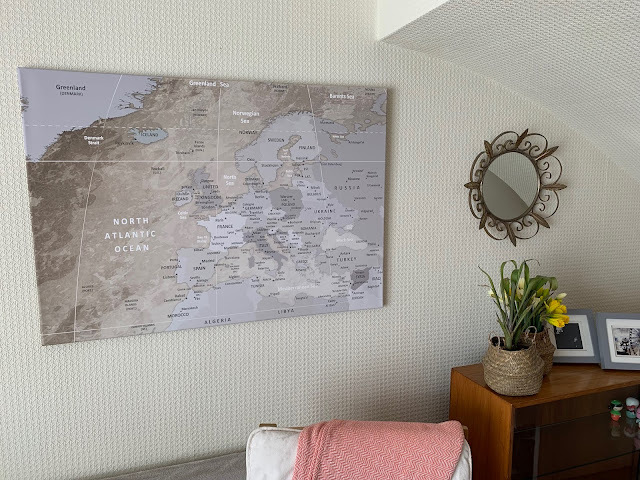 I was contacted by Lana KK to review one of their Canvas Art Wall Maps, which was really strange because Scott and I had literally been talking about it the day before saying how cool it would be for us and the girls to mark off the places we'd been. When the map arrived I wasn't sure how it would fit into my scheme. As you can probably see I'm a big fan of mid-century modern style decor, even though it doesn't exactly suit the style of my home. But I'm not changing it haha! But as soon as I got the wall art up I really fell in love with it. And it looked like it had just always been there. I can't wait to get some more bits up on the wall and really make it a feature. And it's quite amazing what a few pictures will do for your home and the atmosphere. - Create pinterest boards. I find a huge amount of inspiration on Pinterest. 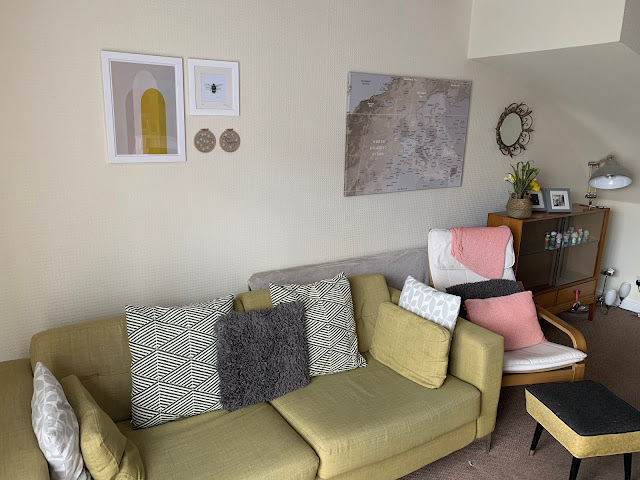 When I’m moving into a new property, I look at the existing colour scheme, my own furniture and try and devise a vision of how I’m going to dress the room, what the accent colours are going to be and how I can incorporate my pieces into the room/s. - Check out local vintage fairs and shops. - Play with textures and colours to create interest and focal points. I find it really hard to buy gifts for people. I hate buying generic flowers, chocolates and smellies. I either want a gift to be super useful, or super indulgent, something that person would never dream buying for themselves. I guess this sand-free towel from Tesalate falls into the first category as something super useful. 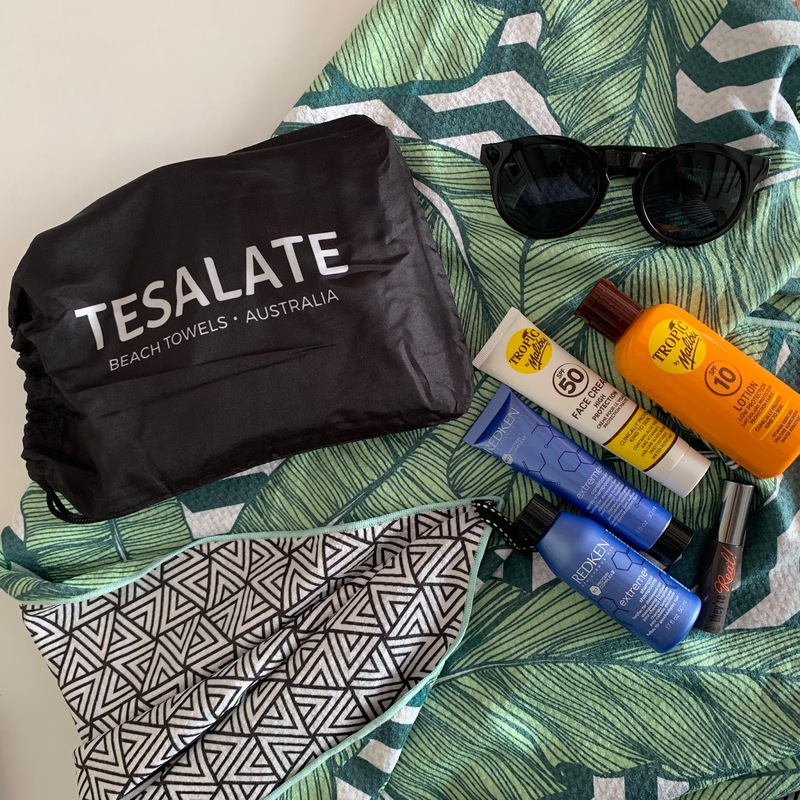 I have seen these towels doing the rounds on social media and wondered if they really lived up to the hype, so when I got the chance to work with Tesalate I was excited to see if it was really any different to your bog-standard beach towel. To be fair, if anyone knows their beach towels it's the Aussies. From being lightweight to super absorbent there is definitely nothing ordinary about these towels. You might be able to pic up form the pictures, but they're a textured fabric that helps repel the sand and aids them to dry quicker than a normal towel. Not only are these going to be great for you, I think they make a really different and yep, you've got it, useful gift. For example if you're buying for a woman in your life this Mother's Day, why not make a travelling light gift pack. Pick up some cute and hand-luggage friendly minis (nothing over 100ml if you're using hand luggage and not hold luggage). Maybe a cheap pair of sunnies and one of these fab towels. 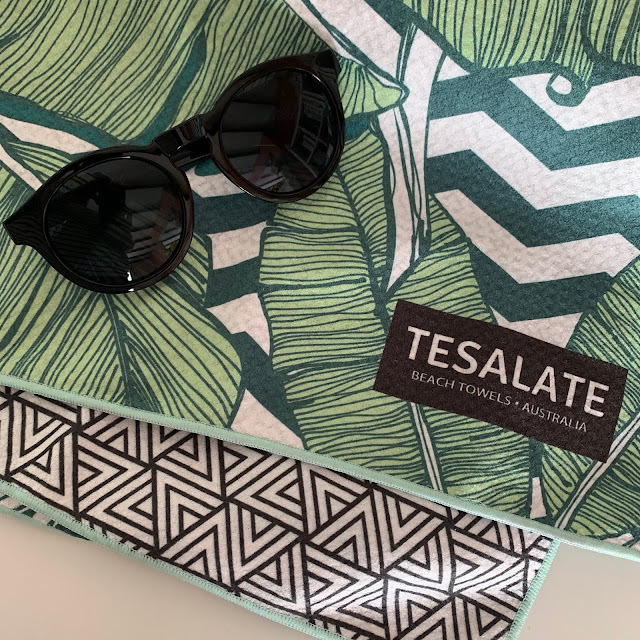 They have loads of prints to suit different tastes, but I of course went for the 'Leaf me Alone' because palms and geometrics... yum, and secondly because that's my general holiday vibe... leave me alone. I can't wait to take my for a real test drive on holiday. But I don't know if I'll be able to wait until then... Swimming anyone? If you'd like to get your hands on one of these. Use the code BeckyBarnes to get 15% off your purchase and all towels come with free worldwide shipping... Bonus!! As some of you might know I started a new job this week. When I found out I'd got the job, I promised myself I would treat myself to a silver necklace I had been eyeing up on the Pickle and Polish instagram. 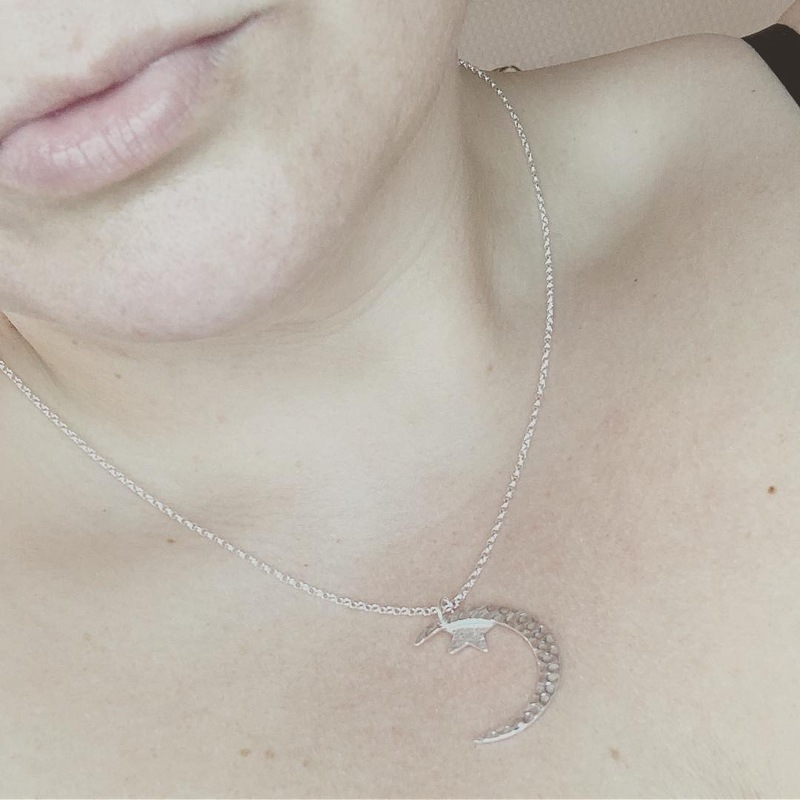 Well as it turns out, the wonderful Adele at Pickle and Polish beat me to it, and very kindly sent me the very necklace I had been lusting over. I absolutely love stars and moons and all things skyward, so when I saw this I was I knew it had to be mine. 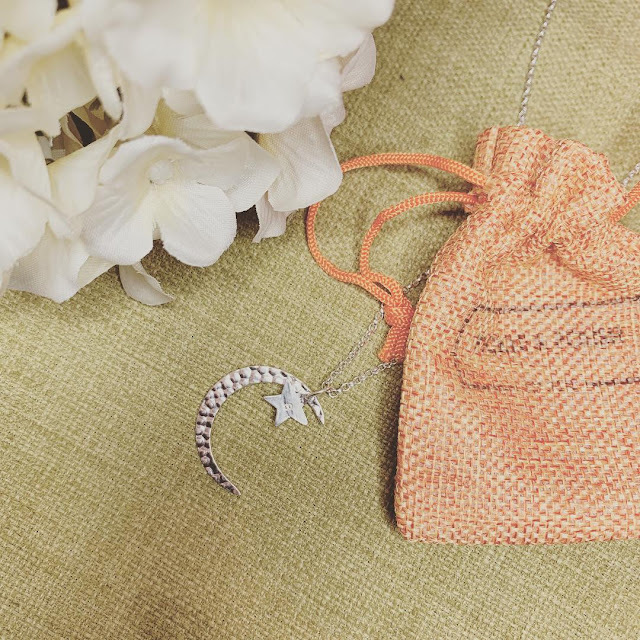 Handmade from sterling silver, the star can be stamped with an initial too for that personal touch. The great news is that because it's handmade, you can choose a chain length that suits you too. Pickle and Polish carry an extensive range of women's, men's and children's jewellery, all handmade, meaning each piece is just a little bit unique. The pieces are priced really reasonably, especially given the time and effort that goes into every beautiful item. And what's best of all, for me at least, is that Pickle and Polish are local to me, so when I inevitably treat myself to some more of Adele's jewellery I know I'll be supporting not only small business, but local business. Treat yourself with 15% using the code BeckyBarnes15. 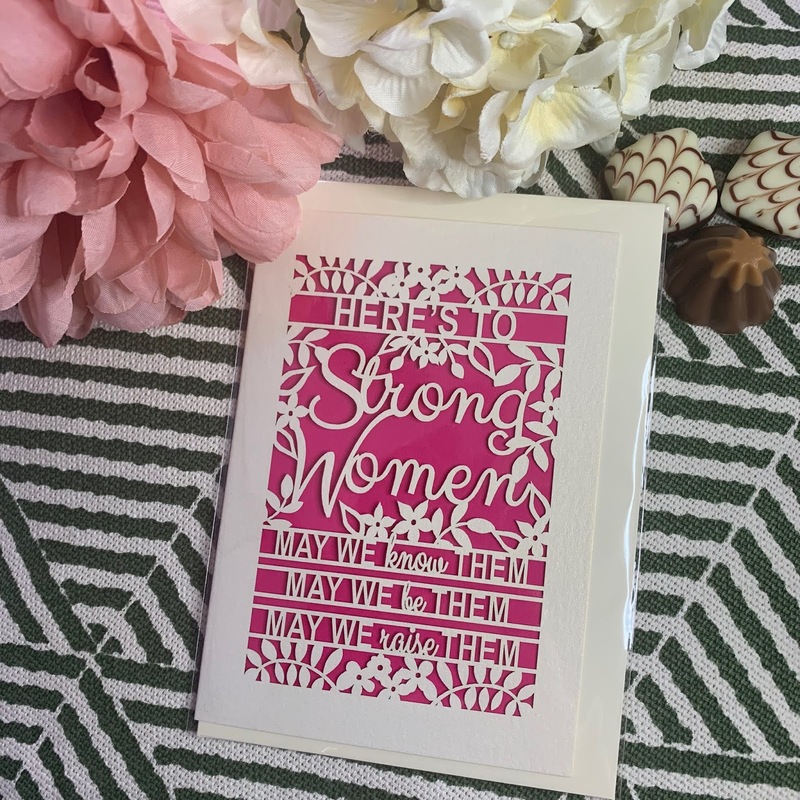 I love a greetings card, not just for special occasions but for 'just because'. They are little pieces of art and never more so than these laser cut cards that the wonderful folk at Pogofandango sent me. With International Women's Day just passed, and Mother's Day at the end of the month, I thought these two cards were great for celebrating the women in our life. 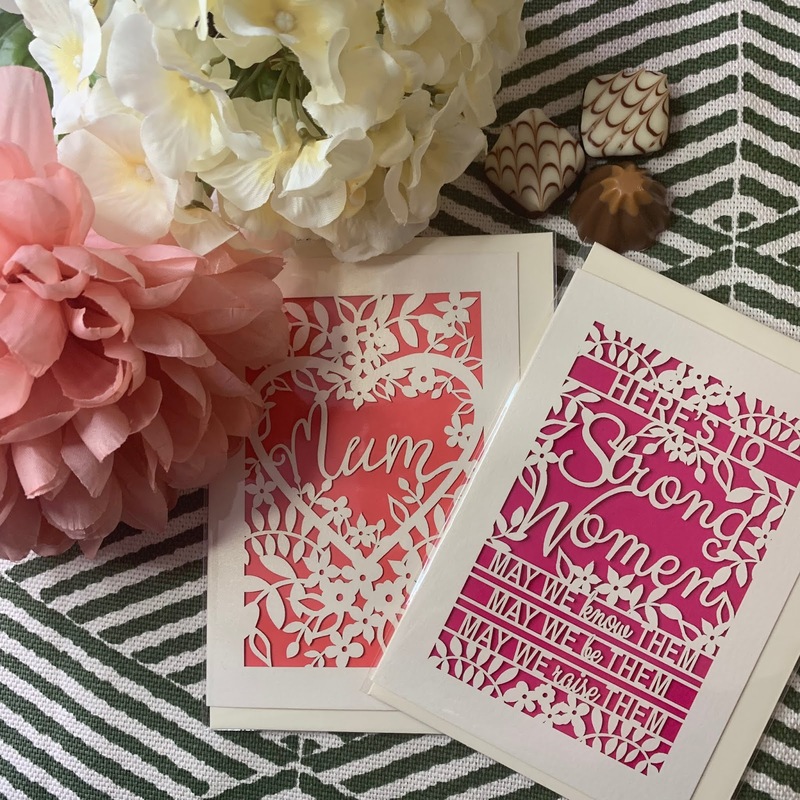 I always think a lot about Mother's Day posts on the blog, I know for a lot of people, the day is not easy, and the barrage of advertising can be incredibly hard going. But I'd like to think of the day as a celebration of the mother figures in our lives, not necessarily by birth, but those strong women who have raised us, supported us and nurtured us. So to celebrate that I've got two beautiful cards, one a traditional 'mum' card and a card for the power gals in our lives. 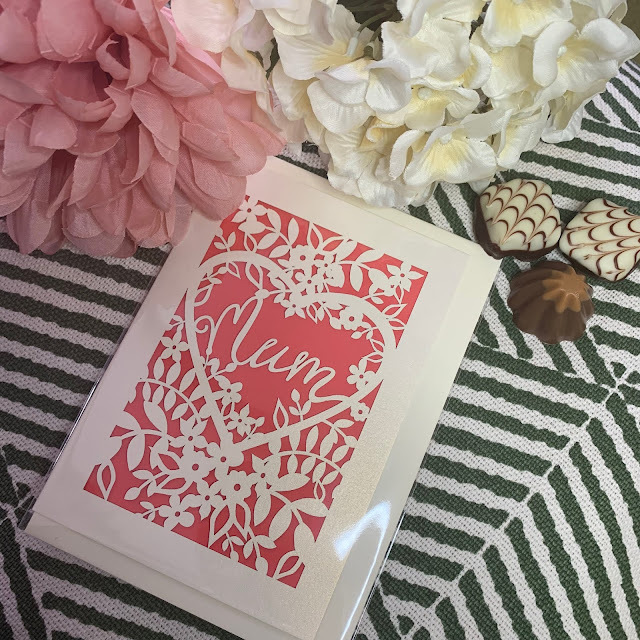 These super beautiful cards are laser cut so they're super intricate and so prettily delicate. I love that they are produced by a small team of women, working to create wonderful things. And that with these specific cards we get to pass them onto other wonderful women. What's so fantastic about these cards is that they really are little pieces of art and completely frame-worthy. So not only are you going to brighten someone's day, these will go on to do that for years to come! Pogofandango have a range of cards for every occasion and is if that's not enough, you can create bespoke cards too. The quality and design are just so special, and delivery is super quick. So if you're looking for something a bit different, these beautiful keepsakes are just the ticket. Howdy! First and foremost you will notice a little change to how I do things. There's a whole lot of new guidelines in regards to bloggers and transparency. So from now on, if I have been gifted an item or paid to write a post you will see [AD] in the title and I will clarify in the first line of text. Right, now I've got the boring stuff out of the way, service as usual. 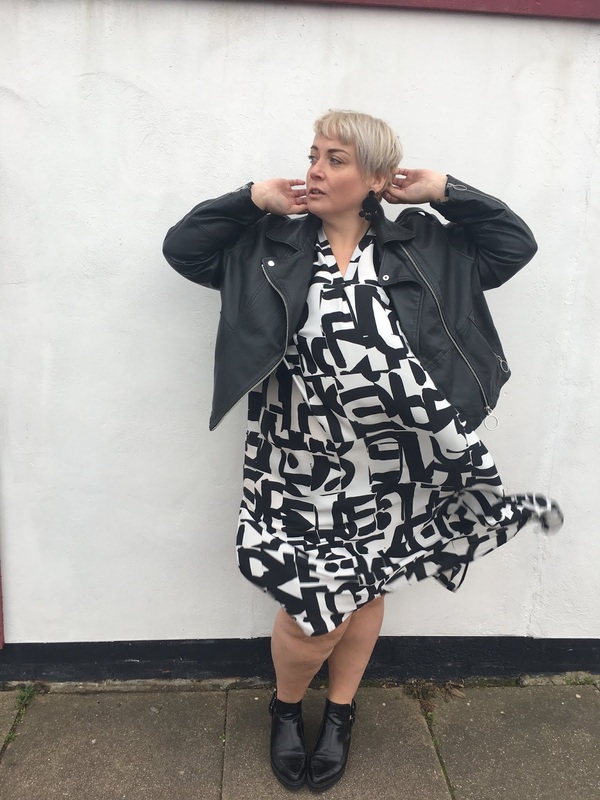 Yoek are a brand I've been aware of for years, Rivkie from Slink Magazine has been a long time fan and always looks fab in their stuff. 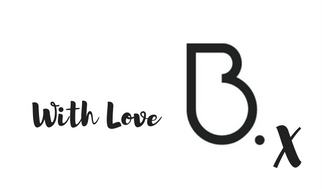 So, while looking for new brands to bring you this year on the blog I took a moment to introduce myself to the team. I wouldn't say Yoek was one thing or one particular style, but I would say that there's probably something for everyone. There's a mix of athleisure, statement pieces and more classic styles. Personally though, I was particularly drawn to the Portraits range, it's packed full of clean lines and bold prints. Right up my street eh? The second I saw the Bodil print I fell in love. It's bold, it's monochrome, it's everything I look for in a garment. I was torn between the three garments in which this print comes in, but eventually went for the dress as I know I would wear the life out of it in the summer, but could layer it up until things warm up. Size-wise I went for the 46/48 which is a UK 20/22. It's generous and oversized, so definitely go for the smaller end of your size bracket. The fabric is a silky soft, lightweight polyester. It's definitely not a budget friendly price. Yoek are around a mid-high price point, but much like some of the other higher priced brands I've covered, the quality is evident in the design, fit and fabric. It literally glided onto my body like a swath of silk. It fitted perfectly, no awkward tugging or pulling. I'm definitely a Yoek convert. It will of course be a treat, but I know when I'm looking for something that little bit different, more stand out, I'll be heading to the site to see what they have in store. Hey! 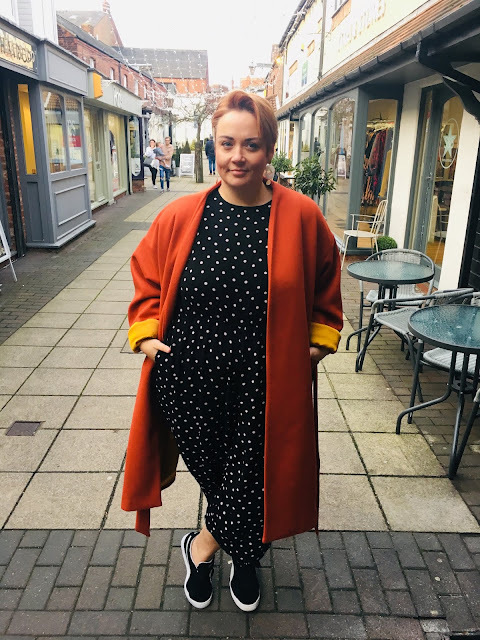 So Bethany has done it again with another stellar collection - Arched Eyebrow for Navabi is a-go-go... Never one to shy away from colour, Bethany has poured her heart and soul into this latest offering proving that bold and beautiful is most definitely a triumphant combo. Me and the mister headed into town yesterday for a spot of shopping and refreshment. Needless to say, I felt fancy AF in this gorgeous coat. Statement coats are something Bethany nails every time and this rust number with gorgeous mustard lining is a complete beaut. It's a lovely weighty fabric, a wool/poly mix in a deep rust colour with contrasting mustard lining. Size-wise it's generous, which I love but if you prefer a closer fit, I'd advise to size down. Length-wise I'm 5'7" and it comes up about knee length on me. The belt is the only way to fasten the coat just to be aware. The thing about coats, is that 10 years ago, before supermarkets and fast fashion outlets really had a hold on the market, I wouldn't have thought twice about spending £80-120 for a distinctly average, probably black, winter coat. Then came a time when we could get our hands on fun colours, disposable coats for under £50. I think we forgot that paying that bit extra for a real stand-out quality item is something that we could all do with thinking about. Granted, not every year, but for the price of three cute but slightly rubbish coats, we could have one amazing one, that everyone admires and you look completely banging in. The 12 piece collection has a great range of statement pieces with a couple of great basics for good measure. If you're looking for something more than just fast fashion, but still want something that packs a punch then for the love of style, head to Navabi to check out the collection. 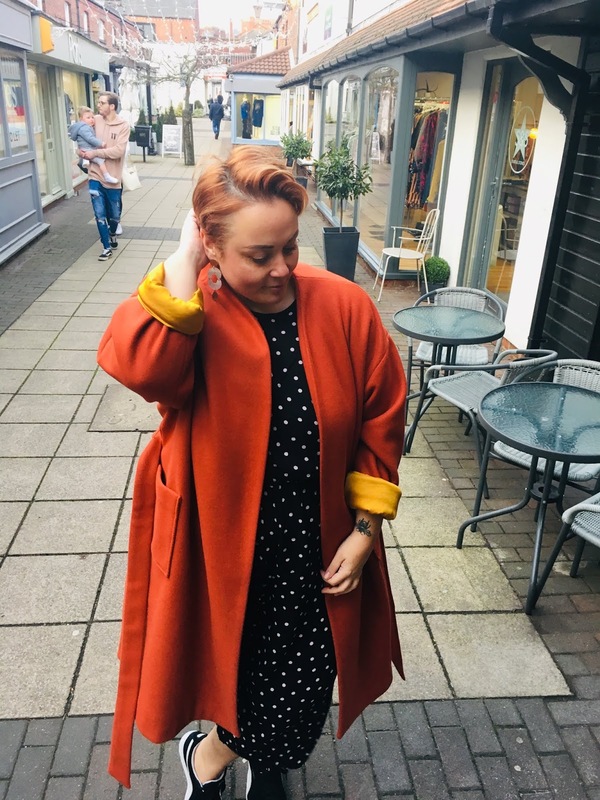 **The coat in the post was gifted to me by the lovely folk at Navabi. Happy New Year my darlings! I hope you all found the time to enjoy the festive period, whatever form that may have taken! I was lucky enough to spend lots of time with Pops, my partner and his daughter and my family. I even got in a meal with the girls. At home, we all managed to get the lurgy at some point which I think is standard practice for this time of year right? And I found out I've got quite a hefty Vitamin D deficiency and Anaemia. Fear not though, I'm dosing myself up to the eyeballs with supplements and lots of leafy greens, orange juice and red meat! So as most of us are fully back into the swing of things I wanted to look at taking a more simple approach to my wardrobe. 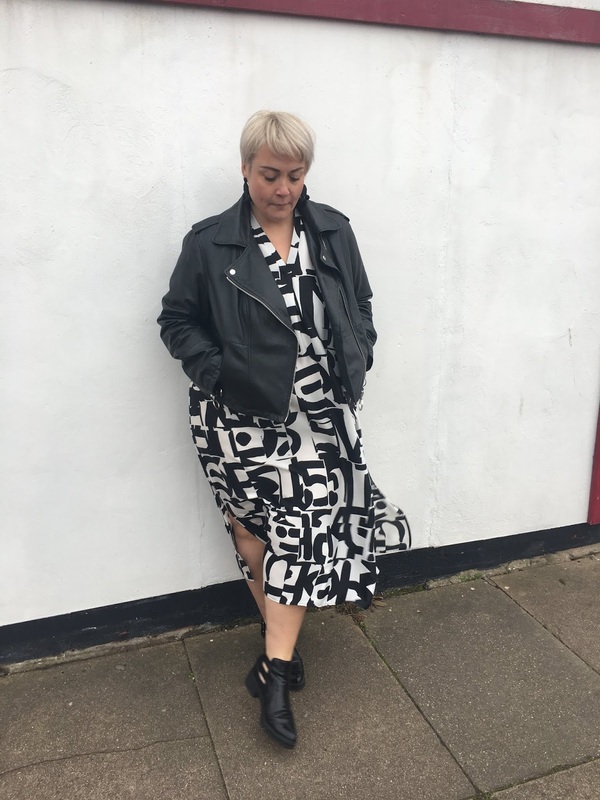 I've talked in the past about uniform dressing on the blog, and even did a capsule wardrobe month. But of late I have definitely found that I'm adopting a more standardised look. I have key pieces in my wardrobe that I build outfits around. And I feel like I'm stating to build a signature look. I still love fashion and incorporating trends into my wardrobe, but I feel like I know what I love and know what works for me and my lifestyle. Without sounding too gimmicky or a bit wanky, I guess this is 'honest dressing'. I'm at the point in my life where I know myself better than I ever have before and I know what's important to me. For me, 'Honest Dressing' should encompass everything you need from an outfit without sacrificing your personal style. I know that if I'm completely honest with myself, my priorities are comfort and practicality, while hopefully still remaining stylish. 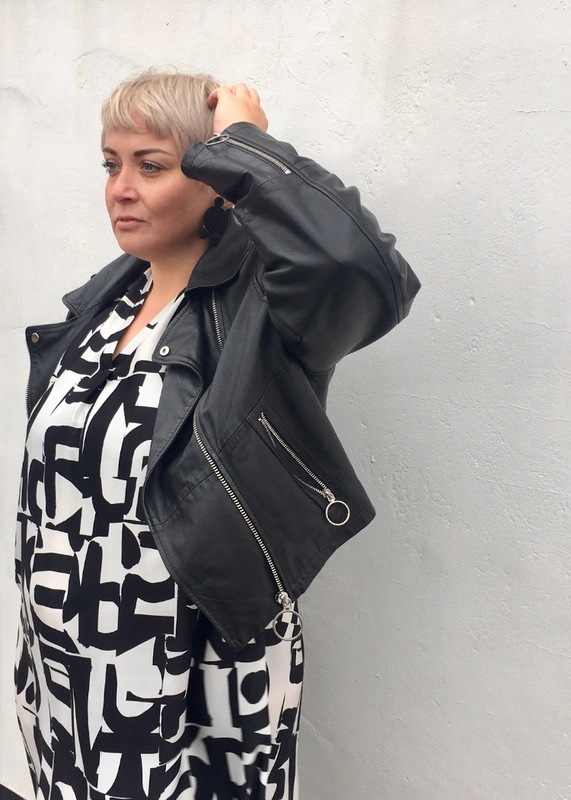 Whether you're a new mum, living with chronic illness, your own boss, climbing the career ladder or maybe you're hitting a milestone age-wise; basically you're at a point where you need to ask yourself what are your style priorities? What challenges and tasks do you face on a daily basis and what kind of outfit is going to facilitate that process more smoothly, while feeling (and looking) amazing. This of course doesn't mean there won't be days where you're going to dress whimsically, sexily and altogether impractically, everyone needs days like that. But I strongly believe once you have found a style you love and you know suits your lifestyle. You'll never look back. The outfit I'm sharing with you today, has to be my winter saviour. I've worn this and variations on it to death, and every time I have felt amazing. It's so incredibly simple, and wearable yet I feel so put together and grown up when I wear it. Starting with the trousers, I have been a long time fan of high waist jersey peg legs. They have been my go-to trouser for some years now. Winter, Summer, travel, events, you name it, I've worn them for it. I currently have three pairs in circulation, but I do need to get some more as they're starting to look a bit scruffy. My current ones are Tu at Sainsbury's (my faves), Pink Clove and Simply Be. A strip tee/sweatshirt is an absolute wardrobe must for me. I would be lost without my collection, they work under pinafores and dungarees, with trousers, jeans and skirts. Basically everything. Down to the shoes and in my opinion you can't go wrong with a pair of converse, but I know they're not for everyone, so find a style you love. I like Nike Air Force 1's: particularly generous for those with wide feet and puma suedes are great too. Finally the coat. A classic, almost formal coat will transform any outfit. For me it adds style, class and a chic touch. They look great over jeans, a casual look like mine but then equally as great over workwear and of course evening wear. I love my grey one. It's the perfect neutral for most outfits. I would highly recommend a camel colour coat too which works with warmer toned outfits. They don't have to cost a fortune either, I picked this one up in the New Look sale last year for £20. This outfit is my school run, food shop, city visit, coffee shop outfit. I know I'll feel great when I put it on, I know I feel confident and most importantly I'll be comfortable. 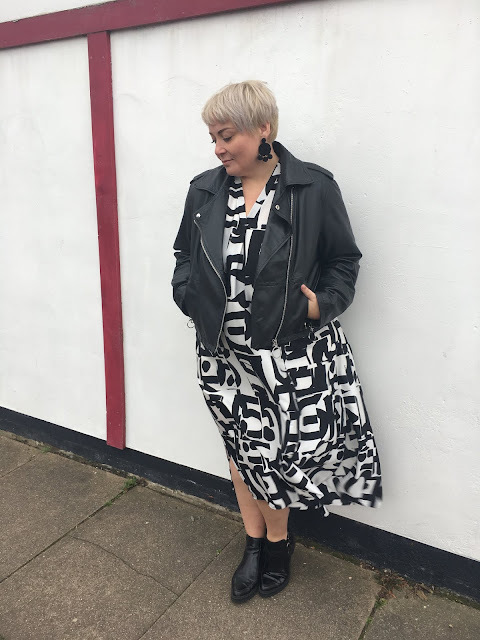 I really can't wait to share some more of my honest dressing with you and hope that this year on the blog, I can develop a bit more of an insight into the way I dress, for both me and you lot too. I've had a look around and have recreated my look using ASOS. You can shop it below! And just a heads up in the spirit of all things honest, they are affiliate links, which means I get a few pennies if you buy anything through my link. A girl's got to earn a living somehow right? I'm really excited for 2019 and would love to hear about any content you'd love to see from me too. Comment below or on social media.